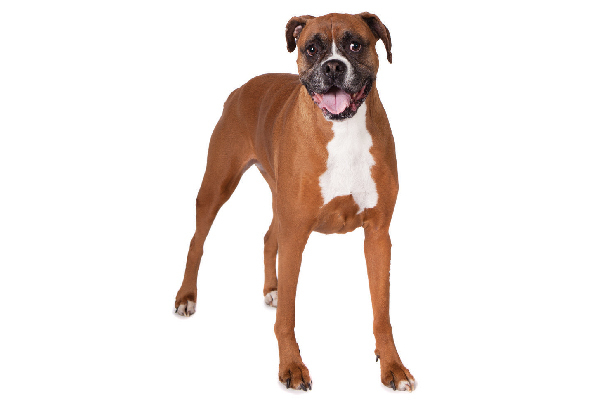 The post What to Know About the Boxer Dog Breed by Lynn M. Hayner appeared first on Dogster. Copying over entire articles infringes on copyright laws. You may not be aware of it, but all of these articles were assigned, contracted and paid for, so they aren’t considered public domain. However, we appreciate that you like the article and would love it if you continued sharing just the first paragraph of an article, then linking out to the rest of the piece on Dogster.com. Self-assured and versatile, the Boxer is an easygoing, multi-purpose working breed with a big appetite for family fun. Part comedian and part athlete, the Boxer thrives on physical activities and, most importantly, human interaction. The Boxer and his ancestors have worked alongside humans for centuries. Although the image of a Boxer standing up on hind legs boxing is mostly fable, the breed’s strength and work ethic is historical. Early Boxer forefathers hunted and held large animals such as wild boar and bear. In 19th century Germany, the Boxer was further developed to assist butchers, hunt, guard and perform in circuses. A Boxer playing with a toy. Photography ©Charlotte Reeves Photography. The Boxer was one of the first breeds selected in Germany for police training. During the world wars, Boxers were guards, messengers and pack carriers. In the Berlin airlift of World War II, a Boxer named Vittles logged over 130 missions with the U.S. Air Force effort. General Curtis LeMay, considering Vittles a great optimism builder to his pilots and crew, had a parachute designed for the dog. Boxers today still work for us in fields such as search and rescue and narcotic detection, but mainly they’re occupied with family business. Although bright and capable, Boxers have a mind of their own. In fact, most Boxers aren’t overly enthralled with routine obedience exercises. What trait distinguishes the Boxer from many working breeds? His renowned sense of humor! He’s known to play the clown in all stages of life, from puppyhood to senior years. Entirely adaptable, the Boxer jumps for joy when the family suggests an outing or activity. Of course families must protect their Boxer on hot days. Because Boxers are a brachycephalic breed (short, wide heads and faces; inefficient panters), they don’t tolerate hot weather well. 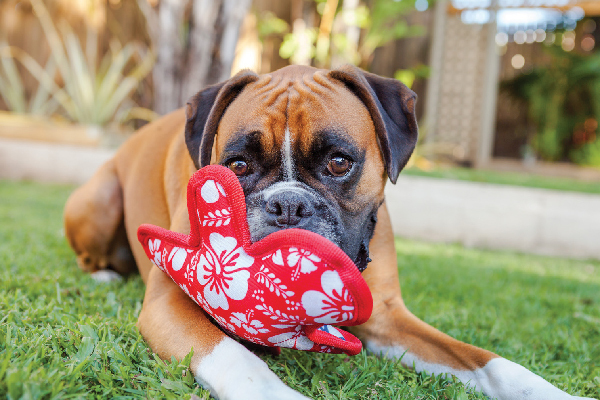 A breed with energy to spare, the Boxer needs both daily walks and vigorous playtimes. Truly multi-talented, Boxers excel in fast-paced sports, such as flyball, but also thrive in social therapy settings. Although a Boxer treasures people of any age, most Boxers are naturally drawn to children. The breed’s sturdy build and cheerful disposition match him nicely with families with children. He’s game on for (supervised, of course!) indoor and outdoor play alike. How big are Boxers? Photography ©ChristineTripp | Getty Images. Grooming: Easy coat care. Simply requires regular brushing. Ears: In 2005 the Boxer standard was changed to include either natural or cropped ears. Underbite: Boxers have naturally undershot jaws. Suggested breed motto: Be stubborn about your goals, flexible about your methods. Gear: Boxers don’t handle extreme temperatures easily. They’ll benefit from coats in winter and cooling mats (and lots of AC indoor time) in summer. Possible health issues: Cardiomyopathy, various cancers, thyroid conditions. Sensitive to both heat and cold. The short-nosed Boxer may overheat when exercising in hot weather. Best for: Boxers match up with sporty singles as well as active families. Although adult Boxers are usually tolerant and playful with children, pups may be too rambunctious around small children. Thumbnail: Photography ©Charlotte Reeves Photography. Originally an attorney, Lynn Hayner writes about dogs and law, in no particular order. Lynn lives in Waco, Texas, with her family, a rescued cat and her German Shepherd Dog, Anja.